A full 3 months after I wondered if Revlon would bring in their Limited Edition Floral Affair collection, I spotted it in our pharmacies. Of course, I had to test it at the counter to see if they were as pretty on the skin as they look. The Floral Affair palettes for the eyes are so pretty. Just look at them! Unfortunately, on the skin, they are sheer. There is hardly any pigment and what you get is sheer shimmer. Ok, so Revlon does say “Make a Sheen” on the cover and they are touted as sheer shades so one shouldn’t really be complaining. But I don’t know how anyone can be using only sheer shimmer on the eyes and pull it off for the day. The packaging is really nice, coming in a clear lucite case. however, the flower pattern is quite deceptive because the flower on the left bottom is actually printed on the cover. When you open the palette, all you see are wavy patterns of colour. The blushes are just as pretty. Again, colour is sheer, but unlike for eyeshadows, I’m ok with sheer colours for the cheeks. You want to look like you are blushing, not like someone slapped you in the face! So, in this case, sheer can be good. 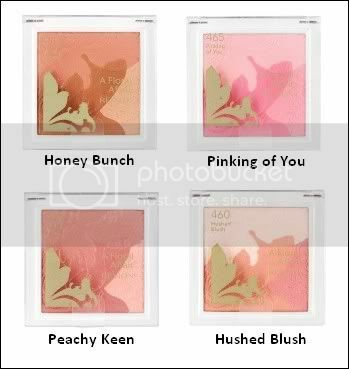 Again, the flower is actually printed on the cover so although it looks like Clinique’s All Over Blossom colour, it isn’t beacuse Clinique’s is printed on the blush. I cannot remember the retail prices but I saw these in Guardian at Midvalley Megamall. They should be available at all Guardian stores and are, I believe, limited edition items. I’d go for the blush if I get them, not only because I like blushes but because sheer eyeshadows with little pigment really get my goat! PREVIOUS POST: What do you use to apply liquid foundation? Those are really cute Parisb!!! I haven’t seen them here YET..maybe I should take a look again!! I have to test them myself!!! Nice, reallly really pretty! Didn’t see them at Watsons–wonder why the collections differ in each pharmacy? It’s only available in certain Guardian, and my.. the price is really expensive compare to the states! me either. I bought 3 namely Olive*2 & Express on ebay, it is so cheap! < USD10 for 3 items. Btw what’s lemming? which color will you recommend if my skin is pretty dark? will light color be enough to show as blusher? I was about to say that I was pretty tempted to get yet another blush, but like jojoba, I wouldn’t pay that kind of money either. So, this lemming also killed instantly. LOL. I shall stick to my Clinique Peony blush, thankyewellymuchie. Hey! I have pinking of you and show stopper copper and I love them both! I agree w the eyeshadows they didn’t really catch my eye so I didn’t make much of them but deff the blushes! Oh! I forgot to say! I use show stopper copper as a blush lol!! Try it out! omg, they’re so pretty! Ahh…. why must I be such a cheapskate that I won’t pay 60 bucks for a blush?? This is why most of my makeup don’t look very pretty. I’m just waay too cheap to pay for packaging *sighs* Honey Bunch looks like a great color for me. And yeah, blush is supposed to make you look like you’re “blushing”. I cant take it when I see how blush is just slathered and unblended on the face. I feel the need to tone it down and smudge off all the harsh lines. To all: Thanks for the feedback and the prices. 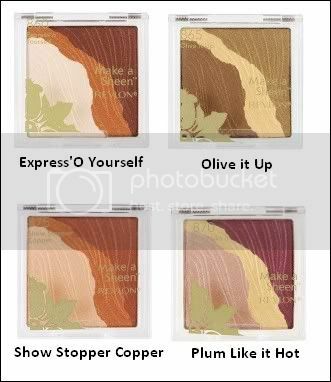 I do think the eye palettes are really too sheer for anyone with darker skintone. Similarly, the lighter blush shades won’t work on a darker skintone, but for medium-dark skintone, Honey Bunch might be pretty for a rosy bronzed look. Sorry I can’t address each comment in turn!